The worldwide prevalence of obesity has doubled over the past three decades, contributing to a marked increase in type 2 diabetes mellitus. Importantly, the number of individuals with prediabetes—an intermediate hyperglycemia phenotype and significant risk factor for diabetes—considerably exceeds the number of individuals with overt diabetes. 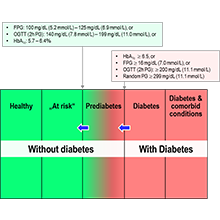 Prediabetes is defined by the same blood glucose homeostasis parameters that are used for the diagnosis of diabetes and the monitoring of diabetes treatment (Figure 1). A subclinical manifestation of complications usually assigned to the presence of advanced diabetes can be sometimes observed already in the prediabetic state, when defined by glycemic criteria. In order to develop efficacious primary diabetes prevention options, prediabetes treatment clinical trials are essential. These should test the safety and efficacy of preventive measures and explore tools to early on identify people that are at high risk for type 2 diabetes. Profil accepts the limitations of a purely gluco-centric approach to prediabetes. We are committed to a more holistic view on prediabetes which acknowledges the role of hyperglycaemia, inflammation and oxidative stress, and the high level of diversity in pathogenetic traits underlying the development of prediabetes. Profil has several strategies to identify individuals who are at risk of diabetes early. These range from the measurement of anthropometric parameters to the analysis of circulating markers implicated in the development of prediabetes and diabetes. Fasting serum insulin, fasting plasma glucose and oral glucose tolerance tests are commonly employed at Profil to serve as indicators of prediabetes. Novel metabolomic and pharmacogenomic markers are investigated with the aim of constantly improve prediabetes phenotyping. Insulin resistance (IR) is a classical feature of prediabetes. It may be present years deterioration in blood glucose control becomes measurable. Profil uses the most accurate and reliable measure of insulin sensitivity: the hyperinsulinemic euglycemic clamp technique. Recent evidence indicates an increase of liver fat as being another key factor predisposing obese people to the development of insulin resistance. Profil provides the measurement of liver fat directly using magnetic resonance spectroscopy (MRS) or indirectly using the fatty liver index (FLI), which is a composite surrogate of gamma-glutamyltransferase, triglycerides, waist circumference and BMI. The FLI has been validated for indicating the presence of a fatty liver and a high FLI is associated with a high prevalence of insulin resistance (as assessed using the glucose clamp technique), elevated fasting plasma glucose and insulin levels, and impaired glucose tolerance. 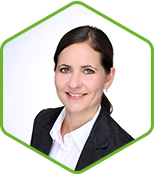 We also support our clients in the development of prediabetes taxonomies based on genetic and metabolic signatures. This approach may improve personalization in metabolic health promotion and diabetes prevention. Supported by metabolomic profiling and health economic modeling in collaboration with our partners in the Center for Biomarker Research in Medicine (CBmed) and the EIT Health Knowledge and Innovation Community, we support our clients in the estimation of cost-effectiveness and the identification of target groups benefiting most from early risk assessment and specific interventions. Further to this strategy, modern ICT-integrating social media, telecommunications, and the internet of things and services will help to reach and motivate specific target groups for metabolic health and diabetes prevention. By enabling patient-initiated research, we pro-actively take the trend to involve users in the decision-making process along the lines of research and development, metabolic resilience, and diabetes prevention. We think that co-creation will greatly improve tailoring of products and services for metabolic health and diabetes prevention to peoples' individual needs. These are prerequisites for patient adherence to lifestyle-changing interventions, which will be one key for reducing incident diabetes and co-morbid conditions. Worldwide obesity levels are double what they were thirty years ago. A marked increase in the incidence of type 2 diabetes mellitus has accompanied this increase. The number of people with prediabetes exceeds the number with diagnosed diabetes, so prediabetes research is an essential field. The Profil Institute for Metabolic Research is at the forefront of research into this condition, providing traditional and novel techniques to help our partners discover the best diabetes prevention plans.